SNHR has released its monthly special report that documents violations against medical personnel, civil defense personnel, and their respective facilities by the parties to the conflict in Syria. The report stresses that saving the wounded is branded now as a dangerous profession that might lead to death, in light of the blatant international humanitarian law violations that affect medical facilities and their workers. According to the report, the Syrian regime has perpetrated the majority of crimes against medical personnel and their medical facilities, as its forces have raided hospitals and abducted some of the wounded, and targeted hospitals and medical points using shells, missiles, and barrel bombs, while their forces have bombed civil defense facilities and international humanitarian insignia repeatedly, killing many of their personnel. The report notes that the rest of the parties to the conflict have perpetrated similar violations but to less extents and at smaller rates. ISIS members raided makeshift hospitals and dispensaries and abducted some of the wounded, doctors, and paramedics. Also, ISIS barred some doctors from practicing as per their discriminative laws while the Coalition forces (international coalition and SDF) have targeted a number of hospitals and medical points. The report adds that violations against medical and civil defense personnel does not only impact them, but also extends to the lives of the people who are in need of medical care services, treatment, and rescue. 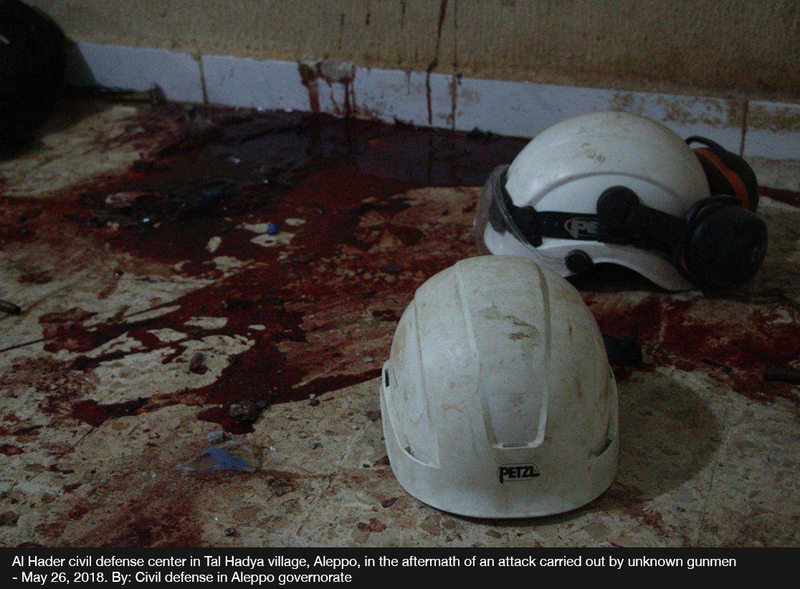 Consequently, these violations result in the death of many of the wounded and those who were trapped in rubble. The report draws upon daily documentation and monitoring, and on accounts from survivors, eyewitnesses, and local media activists, in addition to analyzing a large number of pictures and videos that were posted online or sent by local activists. According to the report, May saw a number of agreements that resulted in Syrian regime forces, backed by Russia, completely seizing control of south Damascus, as well as areas in northern suburbs of Homs governorate. The residents of those areas have been forcibly fled to north Syria. In the wake of those agreements, rates of bombardments by Syrian-Russian alliance forces have notably dropped in most areas, which, in turn, reflected on the overall violations perpetrated in Syrian, including killing medical, civil defense, and Red Crescent personnel, as well as attacks on their vital operative facilities. On the other hand, the report adds, the number of bombings and deaths by gunshot have notably increased in the areas outside the control of Syrian regime forces. The report records that 73 medical, civil defense, and Red Crescent personnel have been killed since the start of 2018 at the hands of the parties to the conflict in Syria, including 43 who were killed by Syrian regime forces. The report documents the killing of six civil defense personnel in May. Of those, one was killed by Syrian regime forces, while the remaining five were killed by other parties. Moreover, the report documents three attacks on vital medical, civil defense, and Red Crescent facilities -one each- that were the result of bombings and gunshots by parties the report have yet to identify at time of this writing. The report adds that the attacks mentioned in this report constitute violations of Security Council resolution 2286 which states that attacks and threats against the wounded and sick, medical personnel and humanitarian personnel exclusively engaged in medical duties, their means of transport and equipment should be ceased, as well as hospitals and other medical facilities.